Entering Taproot Theatre Company on the opening night of Dracula may well be compared to descending into the count’s crypt: the candlelight was futile, the music eerie, and the setting minimalistic. A creepy mood was established, and creepiness expected. Of course, that comes as no surprise to anyone who has read Bram Stoker’s 1897 novel, whose atmosphere of gothic horror, along with its blunt insistence on its presentation of the events as “simple fact,” keeps readers attentive and unnerved. Yet as Nathan Jeffrey’s adaptation of the work progressed, it became clear that it would cause more chuckling than chills. Throughout the first act, Daniel Stoltenberg as Jonathan Harker is the primary cause of the audience’s amusement. As Jonathan’s stay in Castle Dracula lengthens, he responds with increasing alarm to the count’s eccentricities, but is hesitant to make any assumptions (after all, the novel is subtitled “A Mystery Story,” and it is the unravelling of this mystery that intensifies both Jonathan’s and the reader’s fear). In Jeffrey’s adaptation, however, this is not the case; and Jonathan’s uncertainty is more a source of irony than spectator concern in the face of the audience’s knowledge of the story’s oft-told outcome. In other words, he may not know what he has coming, but we do; and what might have been apprehension for his fate–that growing tension typical of horror films–is instead mild amusement at his situation. Nevertheless, when the production does achieve this tension, the audience is palpably more attentive; this is the Dracula they expected. The audience’s absorption is at its height once both in the first and second act: when Jonathan first notices Dracula scaling the castle walls, then returning with a young child, pursued by its sobbing mother; and then later on, when he has manipulated his way into the insane asylum and gets to the beautiful Mina Murray (played by Melanie Hampton). Ironically, Mina, Dr. Van Helsing’s “star and hope” for the case, is probably the star of the show, too: Hampton’s portrayal of Mina’s determination is powerful, yet authentic; and her delivery flawless. Hampton and Stoltenberg are joined onstage by Jeff Berryman as Dr. Van Helsing, Aaron Lamb as Count Dracula and Anastasia Higham as Lucy Westenra. 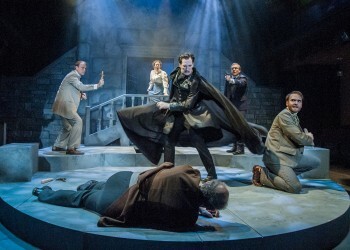 Dracula, adapted for the stage from Bram Stoker’s novel by Nathan Jeffrey. Taproot Theatre Company: 204 N 85th St. Seattle, WA 98103 (North Seattle, 85th and Greenwood). Wed-Thurs, 7:30pm; Fri-Sat, 8pm; Sat matinees, 2pm. Runs through Oct. 24th. Midweek matinees: Sept. 29th (with post-play discussion) at 2pm, Oct. 7th at 2pm, and Oct. 14th (Intergenerational Matinee) at 10am (with post-play discussion). Post-play discussions: Wed nights. Tickets ($20-$40) at www.taproottheatre.org/buy-tickets/ and 206.781.9707.